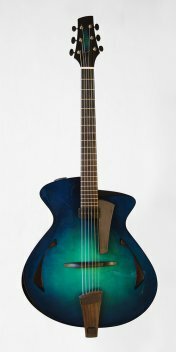 With good reason, archtops are considered the greatest challenge in guitar building. And there’s nothing more beautiful than a hand-carved, elegantly arched top or back. Those curves! Those reflections! 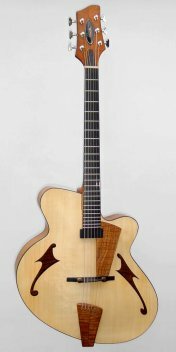 An archtop’s fusion of structure, sound, and elegance is an art that’s not easy to master. And it gets even more difficult when you’re departing from conventional shapes, for example by introducing tighter radiuses - nothing breaks easier than highly flamed wood being bent into shape! But we’re known for outsmarting obstacles, and often, all it takes is more time and patience - and occasionally, an extra set of sides or two. 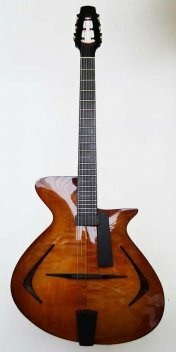 . .
Time and patience are also required for an archtop’s details. Some of these are invisibly located on the inside of the guitar’s body, but even some that are on the outside, such as a solid ebony bridge, aren’t noticed right away. Meticulously shaped to be a perfect match to the top’s arch, a solid bridge yields a fuller sound and quicker response than the typical adjustable designs, where the strings’ vibrations have to travel through a set of screws, and then a separate, possibly flexible, base - no wonder that tone gets lost! Similarly, our tailpiece differs from most standard designs, which tend to be mounted to either a metal hinge or a plastic string. Inspired by traditional Japanese wood joinery (as well as the viola de gamba), our tailpiece is mounted to a matching wood counterpart, resulting in sound transmission that goes from wood to wood, which, in our view, is the best and most honest tonal option. On guitars with pickups, we even include a ground connection to the strings to avoid issues with buzz and hum. Let’s not forget about our reversed pickguard, which is another of our innovations. Typically, the pickguard - often larger than necessary - is mounted with its largest section toward the center of the body. This makes sense from a historical perspective, as players used to have to dig in hard to be heard playing in a big band without amplification. But very few guitarists play that way today, with the result being that the pickguard’s function has largely moved from one of protecting the guitar’s top to being more of a finger-rest and guide for the picking hand. Accordingly, we turned the shape around, with the narrow portion toward the bridge, which not only harmonizes better with the shape of the tailpiece, but also allows for better tone by not covering up the f-hole. It goes without saying that our pickguards attach to the fingerboard extension, rather than being mounted to the instrument’s top. On guitars with electronics, the pickguard also serves as a platform for the pickup (often with a cover made from the same wood as the pickguard itself) and virtually invisibly mounted controls. Speaking of f-holes: Most jazz guitars have them, ours don’t. 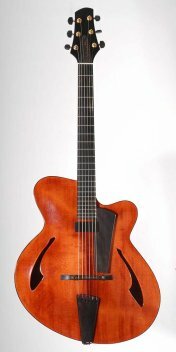 Originating with the family of bowed instruments, the shape was adapted for guitars early on, even though nothing is further removed from how an archtop guitar’s top is excited than a violin. 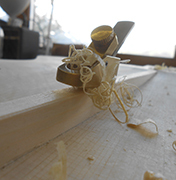 Another reason is that traditional f-holes can easily be cut with a router, while the «f-holes» on our Massari model take two days to realize. A few words about the wood: We celebrated our 35th anniversary in 2015, so it’s only natural that we’ve become good friends with many wood suppliers. Many of them call us when they’ve come across something special, because they know that we’re only looking for the highest quality, and won’t haggle about the price. We simply want the very best, or at least what we consider to be the best, as it’s not always the «normal» pieces of wood that inspire us. As a result, we’ve ended up with an impressive collection!